Treble winners Barcelona underwhelmed as they struggled to a 0-0 draw at third-tier Villanovense in the first leg of their Copa del Rey last-32 tie. Youthful-looking Barca, without regular forwards Neymar and Luis Suarez, only managed three efforts on target. "For a player it is not easy to play a game when you don't have many minutes," said coach Luis Enrique, who gave five players their first starts this season. The second leg of the tie is at the Nou Camp on 2 December. Villanovense, who had eight efforts on goal, went close through Javi Sanchez, whose header came off the bar. Spanish forward Munir El Haddadi should have scored for Barca but fired wide from close range, while defender Marc Bartra had a header from a corner tipped over by keeper Jose Antonio Fuentes. 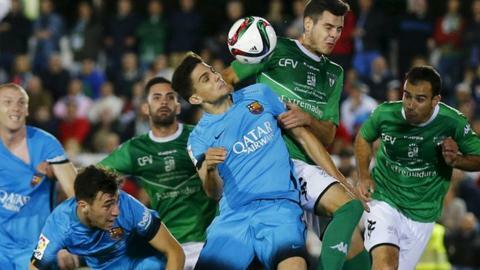 Barcelona keeper Jordi Masip said: "The most important thing is that we didn't give up any goals. "I don't think it was a bad game on our part because we created chances, it just wasn't to be. Now we need to resolve the game at home." The Catalan club won La Liga, the Copa del Rey and the Champions League last season.